As promised, I wanted to take sometime to reflect on the remainder of our Sierra experience and talk about our short trailcation (trail-vacation) in San Diego. 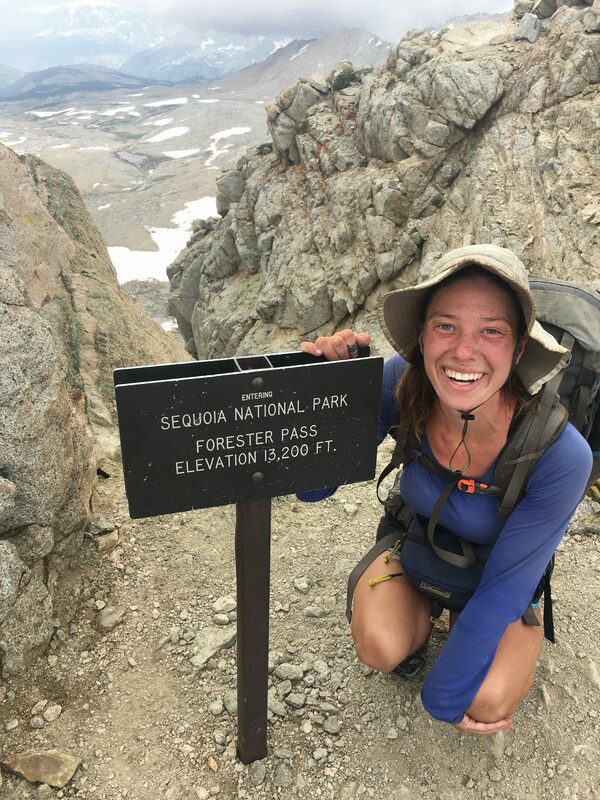 When we last checked in, we were just a week and a half out from finishing our trek through the Sierras (second times a charm!) leaving Yosemite Valley to head south from Tuolumne Meadows. Yosemite Valley was a chaotic scene we hoped to avoid, but a touch of reality from the National Park helped put into perspective how truly wonderful being on trail and away from crowds are. Because Tuolumne Meadows opened late due to the high snow year, we had to hitch nearly two hours into the valley in order to pick up our resupply box. About a half an hour into trying to hitch, a young woman about our age picked us up. She had been on her first solo cross country road trip, stopping along the way for festivals, and she was desperate for some company. We had a great time driving down with her, hearing about her travels and talking about ours. It’s always inspiring meeting other wanderlust souls like ourselves, excited by the outdoors and being on the move. Leaving the park was really the start of what I considered our High Sierra experience. We started by weaving through really flat terrain surrounded by granite peaks and beautiful streams. The second day out, we began our climb of Donahue Pass, and then continued nearly everyday up and over a pass. 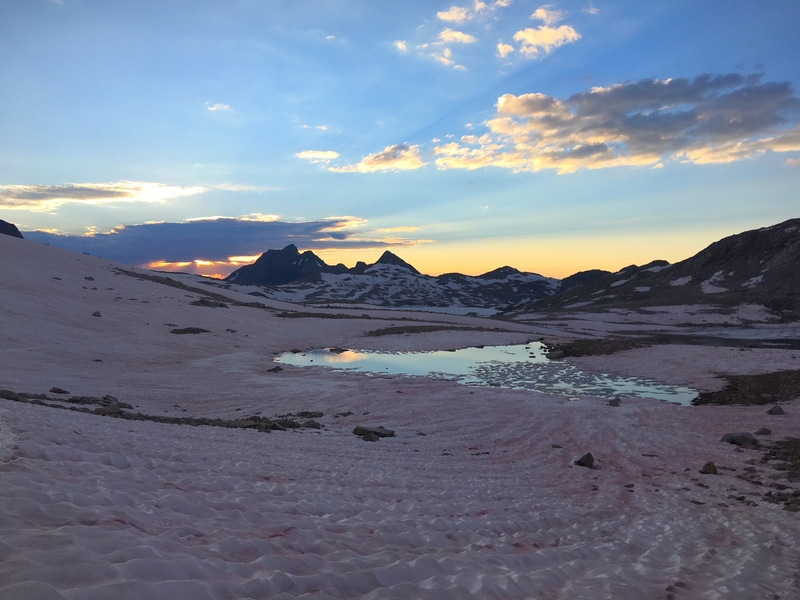 We were often greeted by snowy fields, interesting creatures, and beautiful alpine lakes. Within our last week in the Sierras, we set our sights high on challenging ourselves far more than we had ever done yet. We wanted to get into Lone Pine where we would complete California by Saturday, meaning we would be doing the six passes from VVR in five days total. This meant a couple of things for us… One, we were already carrying a lot of gear we didn’t need so our packs were not particularly light. Ice axes, microspikes, an extra pair of hiking shoes I had shipped myself before the flip, a Z-pad and a Therm-a-Rest ProLite (don’t ask why), an extra pair of socks I couldn’t hike in, and a raincoat and pack cover I hadn’t used once on trail but ended up being grateful to have… My pack seemed to be overflowing with gear I didn’t need. 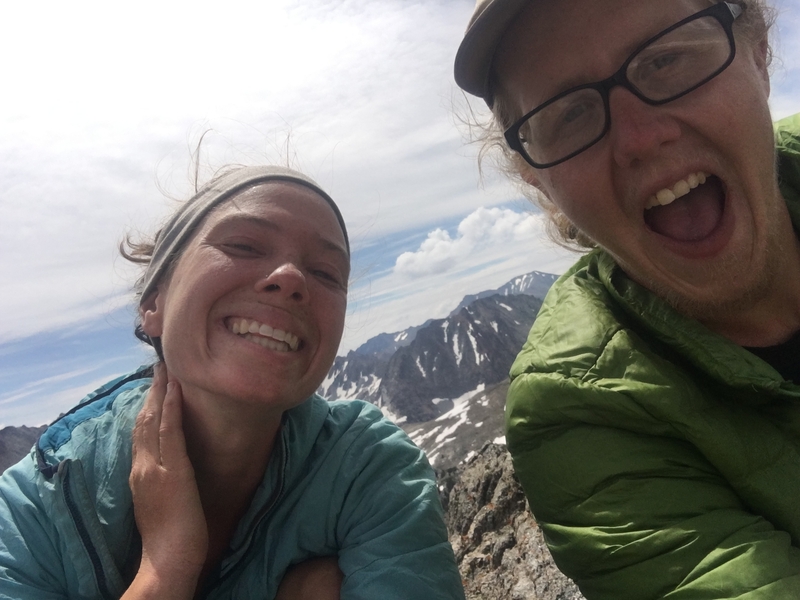 To add injury to insult, we were hoping to make the trek from VVR to Lone Pine (approximately 150 miles or so) without having to get off at Bishop Pass to resupply. Bishop Pass can be an all day endeavor and we knew we had enough food to get by between our resupply box, generous donations from a friend’s parents and a hiker quitting the trail, and the hiker box. By the time our packs were ready to go, we likely had four-six lbs each of excess gear and seven days total of food on us. Leaving VVR was difficult, needless to say. A 57 switchback climb out of the area, lots of steep terrain, and of course we ended our day with our first of six passes, Seldon. We managed to keep our spirits high, enjoying watching the nearby storms roll past us as we set up camp at the beautiful Hearts Lake. The next day, we set out early in hopes of getting all the way to Muir Pass, approximately a 26 mile day. Muir Pass is where the iconic Muir Hut is, a stone emergency shelter at the top of the pass. The day seemed ambitious, but I had high hopes that we would complete our goal. The beginning of the day was easy as we started on a gradual downhill from Seldon and by midday we were doing fairly well at reaching our goal. However, just about three miles from the top, we began to encounter a lot of snow. The snow ended up taking us about two hours and with low energy from the mileage our morale declined quick. Despite the exhausting day, we did get to finish with the sunset behind us creating a rewarding view for us on our way up. 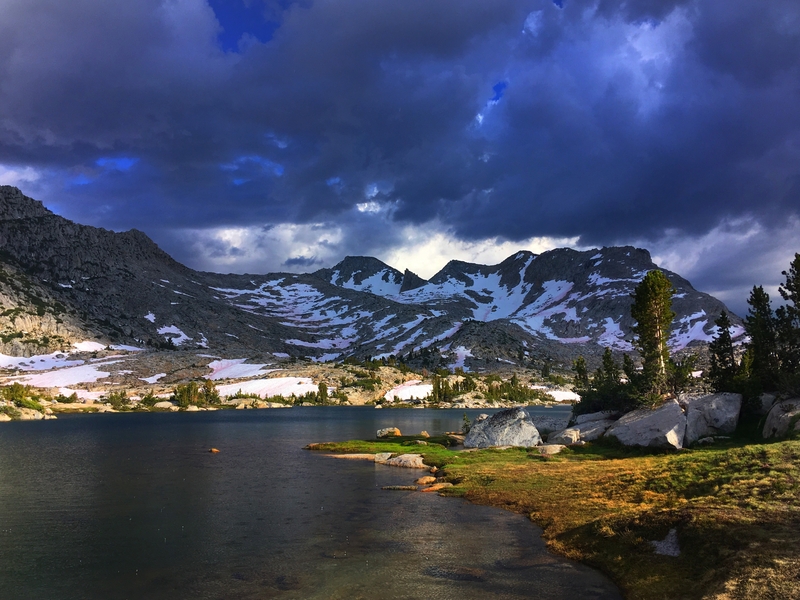 Mather Pass was the following day, one of our favorite passes of the entire High Sierras. The climbs throughout the day were a bit brutal and morale was really low in the morning as we climbed down through a great deal of snow, hitting lunch later than usual and at a much earlier mileage than expected. After lunch, we decided to continue hiking separately in hopes that we could shut into our podcasts and just hike. Somehow, my energy was immediately rejuvenated after lunch and I found myself cheerily climbing up hill. As we approached Mather, we had about two miles of intermittent snow and rock scrambling. Cooper was far ahead of me at the time but kept calling down to make sure all was okay. I slowly made my way up to the top and just as I completed the climb I saw Cooper at the top of the pass, holding a Backpacker Pantry dessert that he had rushed to make for us. We finished the night full of energy, hiking well into dark with an approaching storm and setting up our tent just in time to pull all of our stuff in before we were rained down on. Creme Brule to celebrate the pass? Don’t mind if I do! The following day was likely one of my favorites to start. The climb up Pinchot Pass was extremely gradual and after a long day the day before, I was looking forward to less of a challenge. It felt a bit like hump day- the fourth pass and likely one of the last easy ones before we got into the highest elevation passes. The beginning of the climb was quite easy for me and I ended up getting up to the pass before Cooper, something that rarely happens for me. I spent the next twenty minutes doing yoga, enjoying our marmot friends, and cheering him on from a distance as I watched him climb to the top. With high spirits on the way down, I expected the rest of the day to be a breeze. Unfortunately, the terrain brought a great deal of challenges and frustrations. I remember at one point climbing up an extremely steep and rocky trail, only to immediately begin going downhill. And then we did that again… and again… and again… for over ten miles. Once Cooper and I reconnected towards the end of the day, we both looked beat down. We knew the next day was going to be rough with a climb up both Glen and Forester Pass, the two highest passes on the PCT. We decided it was worth stopping early and trying to get an earlier start the following day, and we hoped we would be able to keep energy high enough for us to tackle the two passes. Full of smiles at the top of Pinchot! Finally our last day of passes had come. We started the day early for us, at about five a.m, and started to ascend Glen Pass. The last mile was covered in snow creating a mixture of rock scrambling and trail building on our part. We kept singing obnoxious 90’s songs and laughing with one another to keep spirits high, all the while moving methodically over the rocks in hopes they wouldn’t dislodge from their place. Once over Glen, we had a beautiful and relatively well graded downhill climb to the base of the next climb. Along the way, I kept thinking about how much I hoped we’d see a bear. If it doesn’t happen today, I thought, I think my chances of seeing one on trail are pretty slim. With Cooper behind me, we were chatting and walking, beginning the initial climb up Forester. I happened to look up to my left and see something moving between two trees. Could it be? What are the chances that today is the day I finally see one..
And sure enough, it was! A bear stumbled between two trees up ahead, off trail, then continued to walk in our general direction. At first I was so excited I just stopped straight in my tracks and kept pointing at it for Cooper to see. As it got closer, though, I began to notice how young it was. I always wanted to see a bear, but a young bear made me nervous. We started to make loud noises, clicking our trekking poles together and singing. As we walked by the bear, a good distance off trail but within eye sight, we noticed it staring at us blankly as we did this as if to say, “What the hell are you doing?” It’s look of total confusion added to our experience as we later continued hiking, making up the internal dialogue of the bear. We had lunch halfway up Forester and then separated for the remainder of the climb. Cooper wasn’t feeling too motivated so he took up the rear and I led us up. About a mile from the top, we started to approach a hill of snow. We climbed quickly, passing five hikers on the way, and then made the final rock scramble to the top. Pass number six, complete! At the top, we took a snack break and enjoyed the view. Three of the hikers made it up not too long after us and, after catching their breaths, took a look at us and said, “Are you PCT hikers?” Being on the JMT for a couple of weeks, we had been mistaken often for JMT hikers. It felt somewhat validating to be at the top of Forester Pass and have a group recognize the endeavor we were working towards simply from the ease in which we had moved up the pass. We chatted for a while with them and then, as a storm began approaching, packed up and rushed down hill into the beautiful meadow below. It felt good climbing down Forester, knowing that the worst of it was done. It was an exhausting, brutal week but the challenge affirmed a lot for us. One thing I struggle with often is being able to calm the voice in my head that says I can’t do this. When times are tough and the physical challenge is hard, my brain wants to shut down and default to comfort. But, if we were able to tackle this, then why not climb up one more steep hill? Why couldn’t we walk through another hot day? Whose to say we couldn’t actually complete this trail, in its entirety? It’s all about the mental challenge at this point because, physically, we’ve already proven we’ve got what it takes. Now we’re resting far from the trail in my hometown of Encinitas. 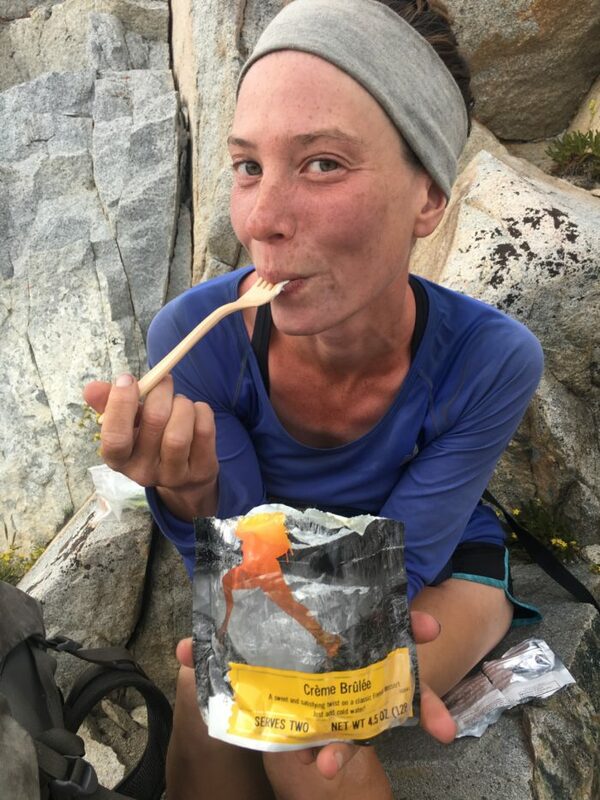 As we finished in Lone Pine, we figured now was the perfect time to give our feet a break, make our Oregon and Washington resupply boxes, and eat enough burritos to gain back every pound we lost. We’ve been really enjoying our time with my parents and friends, but we’re luckily also really looking forward to being back on trail. With the fires in Oregon and Washington, we will be faced with an entirely new challenge of trail closures and heavy smoke, but we’re confident we’ll be able to press through and complete the trail as we initially set out to do. We’ll be back on trail, in Ashland, Oregon, starting this Friday afternoon. Until then, and as always, happy trails! Alexa here, better known on trail as Bonsai. I'm a Minnesota transplant living in the beautiful driftless region of Winona. It was there that I first fell in love with backpacking after attempting a thru hike of Missouri's Ozark Trail. Since then, I've completed the Pacific Crest Trail (17') and have plans to attempt a solo hike of the Superior Hiking Trail in the fall of 2018. When not backpacking, I'm trying my best to overcome my fear of heights by rock climbing, practicing yoga, and searching for the best burrito in the Midwest.. so far with no luck. You can follow my adventures here on The Trek or on Instagram @alexamshapiro. And... seriously... if you know of a good burrito place... hit me up.